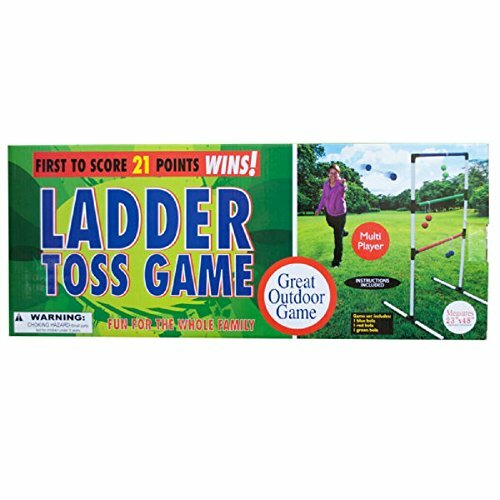 Perfect for outdoor kids parties, poolside activities and everyday play, this Ladder Toss Game features a challenging and exciting game for practicing aiming skills. Players try to wrap their bolas around the steps of the ladder. Bolas consist of two golf balls that are attached to each other with nylon rope. Toss the bolas onto the ladder frame to score points. First to score 21 points wins! Lightweight, durable construction in a water-resistant design is easy to assemble and easy to clean. Set includes game frame pieces, colored bolas, metal stakes and assembly instructions. Game play instructions are printed on back of box. Assembled size is approximately 23" x 48". For ages 3 and up. Box measures approximately 20.5" x 2.375" x 8.375". An All-Time Favorite: Perfect for outdoor kids parties, poolside activities and everyday play, this Ladder Toss Game features a challenging and exciting game for practicing aiming skills. Players try to wrap their bolas around the steps of the ladder. Bolas consist of two golf balls that are attached to each other with nylon rope. An attractive and fun addition to your home. It challenges you to beat your own best score or compete with friends. Premium Quality: Perfect for hours of healthy fun, invite your friends to join a game of ladder toss. Toss the bolas onto the ladder frame to score points. First to score 21 points wins! Compact & Durable: Lightweight, durable construction in a water-resistant design is easy to assemble and easy to clean! Challenging & Exciting: Set includes game frame pieces, colored bolas, metal stakes and assembly instructions. Specifications:Game play instructions are printed on back of box. Assembled size is approximately 23" x 48". For ages 3 and up. Box measures approximately 20.5" x 2.375" x 8.375". View More In Ladder Ball. If you have any questions about this product by Daily Basic, contact us by completing and submitting the form below. If you are looking for a specif part number, please include it with your message. Trademark Global Ladder Toss Outdoor Game, Two PVC Game Sets with 6 Bolas and Carrying Case for Kids and Adults by Hey! Play!